A baseline is the average performance of a global set of publications with the same subject area, document type and year. For example, a global set might consist of all articles in the field of chemistry published in 2006. Baselines and subject schemes create useful reference points for comparison, and they are the basis of normalization to overcome subject bias. Baselines are calculated using a whole counting method, this means that all papers in a subject area are counted towards the baseline calculation regardless of whether those papers are also in other subject areas or not. Note: The citation distribution for any set of publications is typically skewed towards a small number of highly cited papers and a large number of papers with relatively few citations. Because baselines are based on the mean of a set of papers and the mean is influenced by the presence of highly cited papers, the mean average will be considerably higher than the median. Therefore more than half the publications are below the mean average. The following chart shows the differences between the Citation Impact of various subject categories. 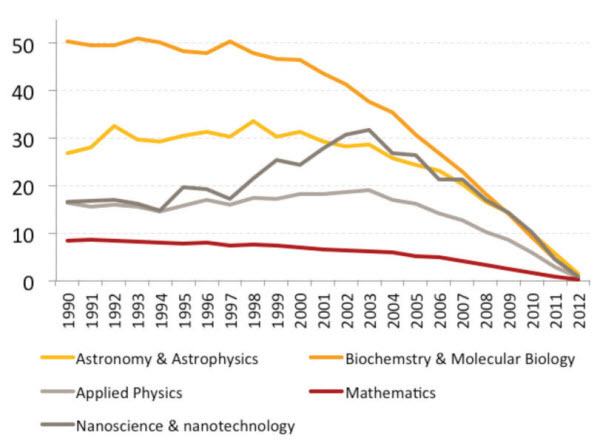 Mathematics has a lower Citation Impact than biochemisty & molecular biology. Recent publications exhibit lower citation impact due to the fact that older papers have had more time to accrue citations, and therefore exhibit a higher average citation count. Citation Impact can vary significantly across different disciplines and time periods so it cannot be used effectively to compare entities that are in different subjects or years. In these cases it is preferable to use some form of normalization to allow for the differences in fields and time (see Normalized Citation Impact, % Documents in Top 1% and % Documents in Top 10%, Average Percentile). Five-year baselines are used in the five-year trend graph. Each document will be assigned five new baselines, one for each five-year time period it appears in. Each five-year time period acts as a single year baseline as described above, normalizing for document type, category/journal, and using an average of baselines for documents appearing in multiple categories.